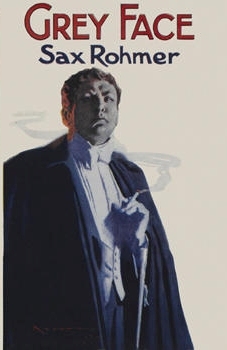 William Patrick Maynard was authorized by Sax Rohmer’s literary estate to continue the Fu Manchu thrillers. Black Coat Press published The Terror of Fu Manchu in 2009 and The Destiny of Fu Manchu in 2012. His third title, The Triumph of Fu Manchu is due later this year. His short fiction has been published by Titan Books, MX Publishing, EDGE Publishing, Airship 27, among others. He has authored nearly 300 articles for BlackGate.com. His audio commentaries and supplemental content have appeared on DVDs and Blu-ray releases from MGM, Shout Factory, Kino-Lorber, and The Serial Squadron. While the creation of the nearly immortal Dr. Fu Manchu will forever associate Sax Rohmer with the Yellow Peril, it was the call of the supernatural that he answered most consistently throughout his 56-year career as an author. Although the Fu Manchu series was marked with undercurrents of reincarnation and regular displays of Mesmerism, it was clear that magic was a branch of science practiced only by the elect. Yet Rohmer can hardly be said to have shied away from more traditional forms of supernatural fiction as Brood of the Witch Queen (1915) and Grey Face (1924) proved. The former is best remembered because of H. P. Lovecraft’s fondness for the book while the latter is somewhat more obscure, though deserving of reconsideration. That aside, it must be noted that actual occult practitioners, though appreciative of Rohmer’s acclaimed historical overview, The Romance of Sorcery (1914); most often deride his occult fiction for greatly exaggerating the abilities of an Adept. His very earliest fiction, “The Mysterious Mummy” (1903) and “The Leopard Couch” (1904) display a fascination with Egypt and its mysterious traditions. His best work in the field, “Tcheriapin” (1922) and “Dr. Kreener’s Last Experiment” (1920) show the clear influence of Robert W. Chambers’ The King in Yellow (1895). Though always mindful of the commercial market for his fiction, he returned again and again to Egypt and the occult throughout his career. Who was Sax Rohmer and from whence did his occult knowledge stem? As we shall see, Rohmer’s penchant for storytelling was greater than his devotion to truth. Rohmer claimed he was brought into the world by Richard Watson Councell, the family physician who was also an avowed Theosophist and Freemason in good standing. A regular contributor to The Occult Review, Dr. Councell authored a rare Theosophical work, Apologia Alchymiae which was published in a limited edition of 500 copies and featured a preface by his patient and protégé of many decades, Sax Rohmer. Rohmer was born February 15, 1883 (under his given name of Arthur Henry Ward) just over four years before Richard Watson Councell (who was only 21 years older than Rohmer, having been born Christmas Day 1861) passed his Primary Professional Examination at The Bristol School of Medicine. Therefore, he could not have delivered Rohmer as a child, though he was the family physician for several decades. Dr. Councell was also Rohmer’s primary source of knowledge on occult matters, but his background as a Theosophist hardly matched the fellowship among the Rosicrucians and the Hermetic Order of the Golden Dawn that Rohmer later falsely claimed for his own occult credentials. Though married for 50 years, Rohmer had no children which made it easier for him to maintain his association in bohemian circles and to continue participating in various scams with the remnants of the Cockney Oakmead Road Gang he ran with in his youth. It is likely that his alleged membership to occult societies was partially used as a cover for his extramarital affairs and other dicey pursuits including various Get-Rich-Quick schemes and outright cons just as his later claims of involvement in government intelligence work. Information in his wife’s biography of him, Master of Villainy (1972) would make it likely he took advantage of his wife’s naivete until his indiscretions finally caught up with him. His adoption of the pseudonym Sax Rohmer (he originally claimed to be an abbe in his earliest use of the name) was tied to his desire to create an exotic alter ego who could believably convey a man of mystery with Esoteric knowledge at his disposal. His earliest published stories, though otherwise unremarkable, show a desire to establish himself as an author who specialized in occult horror. It is worth noting that it was Rohmer who claimed to share membership in the Golden Dawn with Bram Stoker (the author of Dracula) who likewise had no direct involvement with the Society. A spurious remark that has led many a Stoker historian down a blind path. The passing of Dr. Councell in 1929 left a hole in Rohmer’s life and a notable slackening in his occult writings and supernatural fiction. Some of this is also attributable to changing markets for Rohmer was always motivated by commercial instincts. His wife’s growing discomfort with his occult experiments was also noted in her memoir of her husband. The curious reader is certainly advised to sample the adventures of Rohmer’s occult detective, Morris Klaw collected in The Dream Detective (1914). Though a thorough reading of his fiction and non-fiction reveals that the two Music Hall stars he wrote comedy sketches and humorous songs for, George Robey and Little Tich, both shared his interest in the occult and the three of them scoured used bookstores and antique shops wherever their travels took them, frequently sharing the treasures they discovered with one another. Seen from the vantage point of examining the over sixty books and dozens upon dozens of collected and uncollected short stories (as well as his various articles), it is clear Rohmer most frequently wrote of the impact of the discovery of Lost Egypt upon the British Empire. Egypt held his heart and teased him with the allure of discovering and deciphering its Gnostic secrets. The fact that Rohmer’s actual knowledge of the occult was limited outside of historical knowledge of its chief practitioners and the initiation rituals of its most prominent societies did nothing to inhibit his fiction. His stories still offer the paranoid thrill of the exotic that lies just around the corner in a dark alleyway or in the hidden backroom of an otherwise dreary storefront. The sun was setting on Victoria’s Empire, but Sax Rohmer was only too aware it was the same sun that burned bright in the skies over Ancient Egypt and Atlantis. His awareness of Time as a dispassionate observer to the rise and fall of empires made him cognizant that all that was precious would one day be lost. Only those who steeped themselves in the past and lived outside the present could ever hope to rediscover those treasures. That is what the occult meant to Sax Rohmer and that is what Sax Rohmer means to me.